If you’ve been praying for a blog post about an awesomely violent movie, you’re in luck! Though I question your prayer priorities. That’s because so much of what makes this movie work is the amazing skills of lead actor Tony Jaa (born Panom Yeerum). A wunderkind student of his native Thailand’s Muay Thai (a martial arts discipline putting heavy emphasis on the use of elbows & knees), Jaa performs all manner of mind-blowing physical feats. And as I can’t speak the language it’s hard to gauge his acting skills, he’s certainly eminently watchable even when he’s not cracking skulls, possessing an expressive face and likeable demeanor. In the ten years (!) since this movie first opened, Jaa has inexplicably not become an enormous Hollywood star, to the detriment of both parties. The Protector (aka Tom Yung Goom) his follow-up collaboration with Ong Bak director Pracha Pinkaew, was often superb but threatened to collapse under its own silliness. 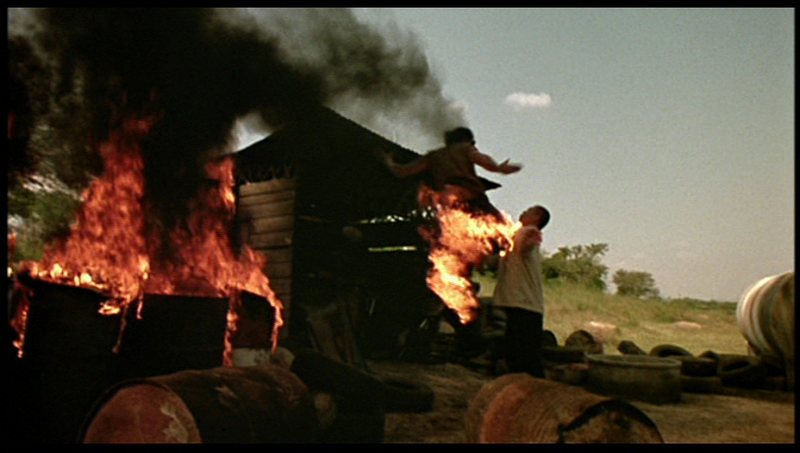 After a falling out with Pinkaew (a competent director who seems to overestimate his cinematic prowess), Jaa made a few Ong Bak prequels that I haven’t seen but are generally regarded as a few amazing sequences drowned out by incomprehensible nonsense. Apparently Jaa is slated to appear in the seventh entry in the Fast & Furious franchise, which might be just the right type of ridiculous he needs. Anyway, since Ong Bak is a fairly action-packed movie, we’ll be taking the Retrospective approach, breaking the post into two halves for purposes of length. The film’s premise is that someone has stolen the head of the titular Ong Bak, a stone Buddha statue that the denizens of a humble Thai village regard as a sort of deity all its own. 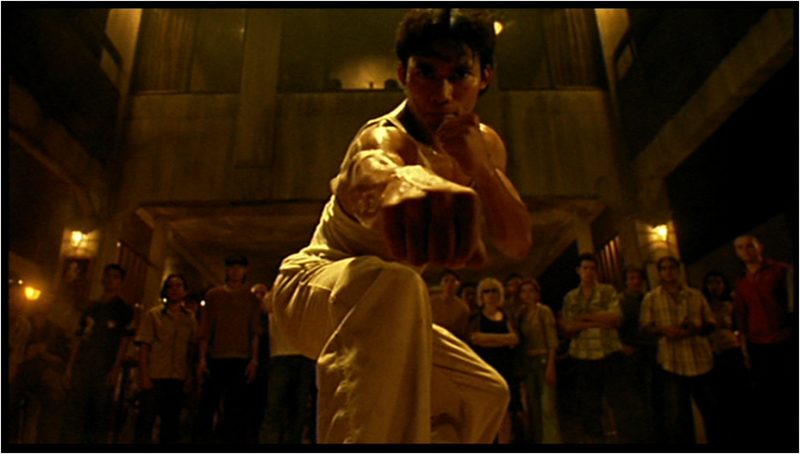 Ting (Jaa’s character), the village’s humble Muay Thai champion, volunteers to go to Bangkok and track it down. This leads to lots of “humorous” hijinx with village outcast Humlae and a conflict with a mob boss who speaks with an electronic larynx, not to mention lots of fighting. 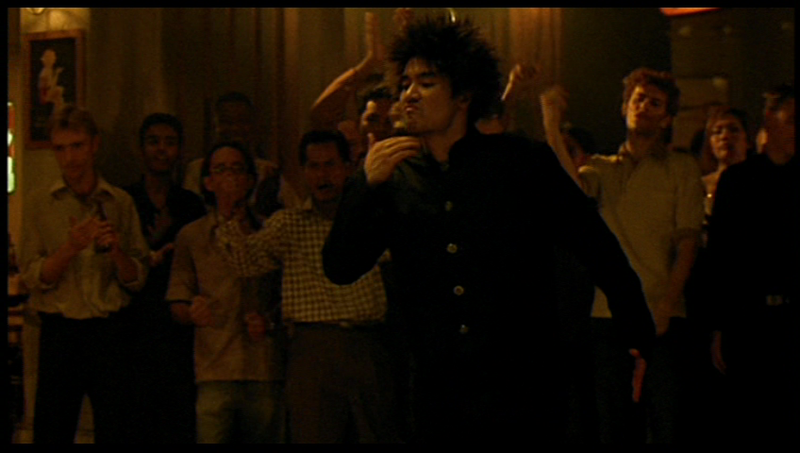 Ting Fights: Peng, a small-time drug dealer and his gang of thugs. Peng is after Humlae and his platonic gal pal Muay Lek, over some scam or another. Ting gets in the middle of it after he puts a slight but intimidating beating on a handful of the goons, which only leads to Peng returning minutes later with serious reinforcements. The Fight: It’s more of a chase than a fight, really, because due to a combination of pragmatism and pacifism, Ting decides that discretion is the better part of valor, and books it. Humlae and Muay follow suit, which splits the bad guys up. Comic relief Humlae has a couple fun moments here, such as throwing spices into his pursuers’ eyes, and scaring more off with a handy meat cleaver… until, in a well-timed bit, a little old lady walks by selling more big knives, canceling out his advantage. But this sequence is mostly Ting’s game, and what a merry game it is. 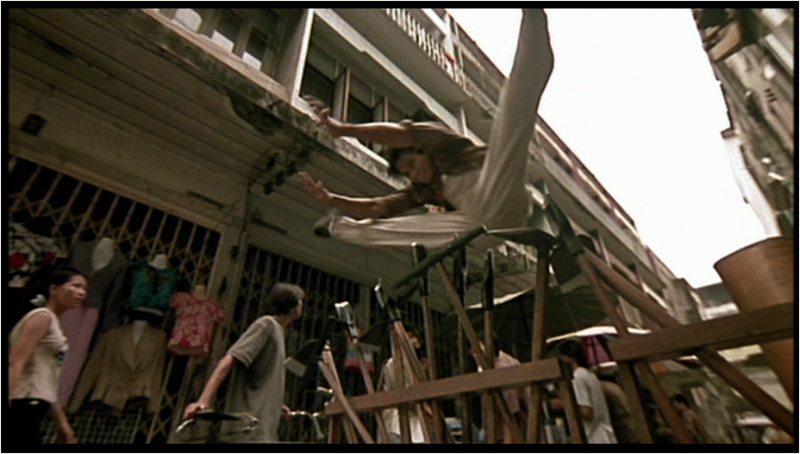 From Buster Keaton down on to Jackie Chan (one of Jaa’s idols), there’s a grand cinematic tradition of foot chases through urban landscapes littered with all sorts of delightful obstacles, and Ong Bak makes an honorable new entry to it. There’s an absurdly improbable amount of creative hazards in the open-air markets that make up all these alleys, and Jaa navigates them beautifully. He demonstrates not just a trained martial artist’s agility but also his skill as a high jumper, casually leaping several feet either vertically or horizontally. 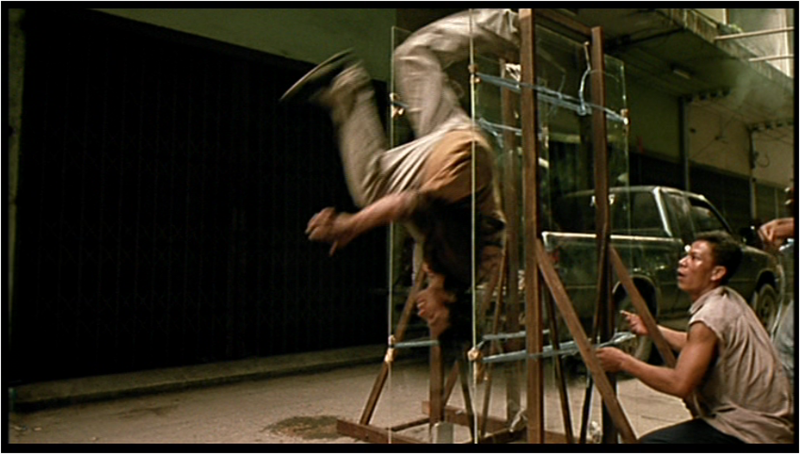 For instance, there’s the old standby of two men walking through with a sheet of transparent glass (enough of a cliché that Wayne’s World 2 was already mocking it twenty years ago), but Pinkaew puts a nice twist on it by making it two sheets of glass and turning them sideways, so that Jaa can squeeze a backflip between them. “I could totally do that too,” you didn’t just say. Also just so happening to pass through one alley are two men carrying a bunch of rolled-up barb wire, which Ting naturally leaps right through, tucking his limbs as far forward as he can so he can just barely fit. Ting leaps over moving cars in a single bound. He gets cornered at one point and escapes by simply climbing around on the shoulders of his surprised foes. He gets around a rack full of upturned, sharp gardening instruments by jumping over them while doing the splits. And, of course, he fights here & there, whenever he has no other choice. 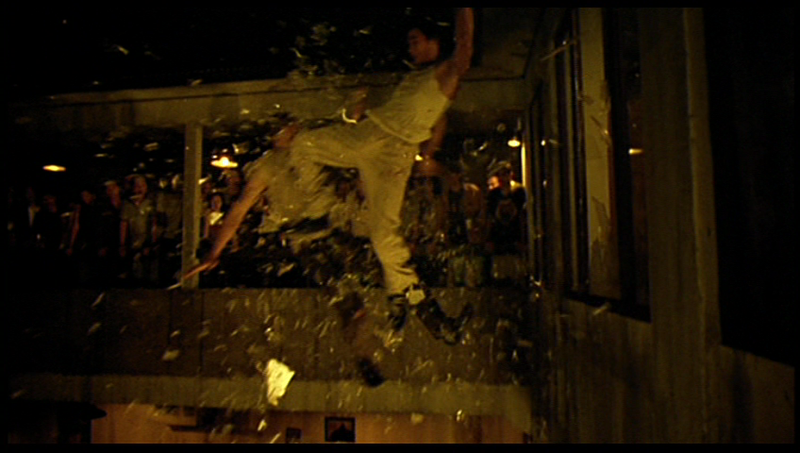 The most extended fisticuffs sequence comes near a multi-story scaffolding, which Ting of course fights all around, flipping on & off it as necessary and looking so cool. The various beatdowns thin the number of bad guys, but there’s still plenty left when Ting & Humlae end up together again, cornered against a high wall. Ting is agile enough to bounce up to safety, but chunky Humlae can’t follow. Ting has had near enough of Humlae’s crap at this point but relents and assists his old pal when Humlae offers to finally take him to his one lead on Ong Bak’s missing head. Which leads to our next entry, but we’ll get there. It takes a while for the movie to get to this, its first true action scene, but it’s pretty much worth the wait. 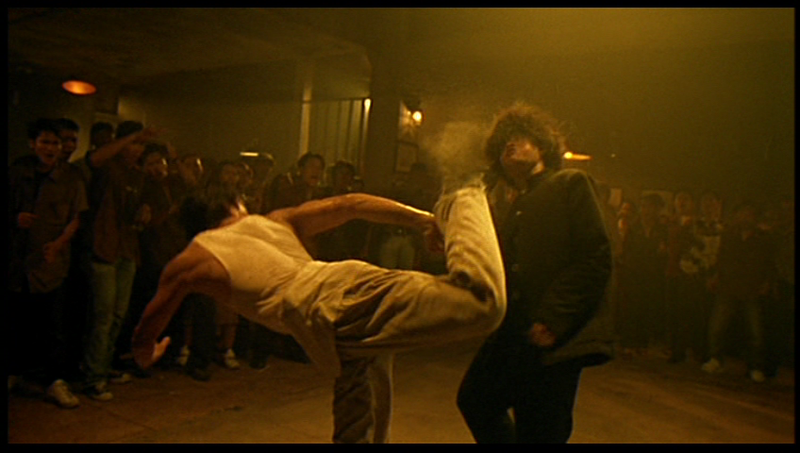 We’ve already seen Ting’s raw skill as he demonstrated various Muay Thai stances in a solo exhibition early in the movie, so it’s nice to see a little diversity in his skill set; besides, if you’re looking for extended scenes of pure fisticuffs, the next sequence is most definitely going to fulfill your quota and then some. Pinkaew films ably and surely deserves some credit for many of the clever sequences. Stylistically this also sets the scene for a trick that Pinkaew will return to again & again: the inclusion of successive takes. Basically, if a certain move or stunt was particularly tricky or impressive, Pinkaew is damn sure going to make sure you watch that move two, three, maybe even four times, and always from multiple angles. Not exactly original and it breaks the fourth wall a little bit, but you can hardly blame him: if you had that much footage of Tony Jaa doing awesome stuff, wouldn’t you want to share it too? 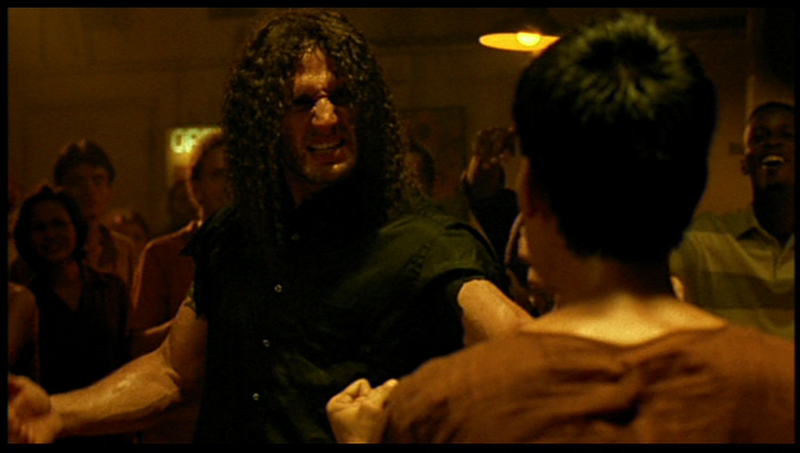 Ting Fights: “Big Bear” (presumably not his Christian name), a big, muscled Australian with long greasy hair. Bear declares that he’s a “freestyle” fighter– i.e., an undisciplined brawler. But still plenty tough enough for the average guy… which Ting isn’t. 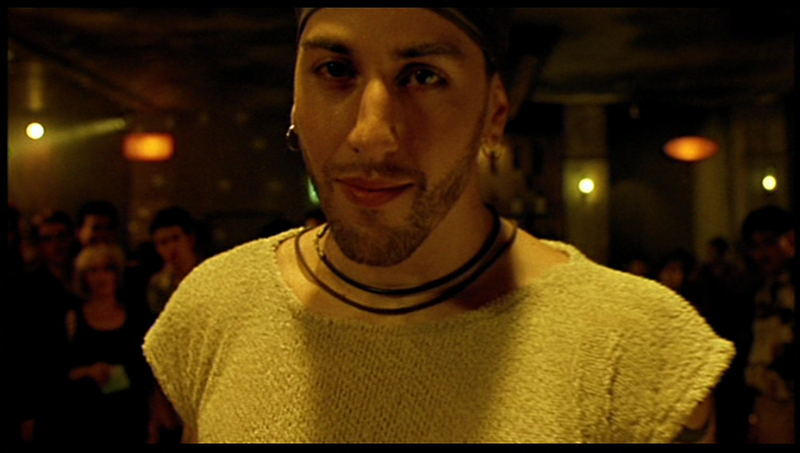 Played by Nick Kara. Ting enters the local seedy fight club with Humlae, as that’s where the latter said their thief hangs out, while Big Bear is beating down some schmuck. The announcer sees Ting (he’d been there before and laid a guy out with one sweet kick in order to retrive his stolen money) and tries to egg him on into a match with the Aussie. Bear’s up for it, but Ting demurs. Bear does everything he does to provoke Ting, shouting various curses & slurs at him (in English), and battering a skinny Thai fighter who tries to stick up for his homeland. It’s when the burly man starts harassing a Thai waitress that Ting decides it’s time to put the bear down. The Fight: Very nearly a curb stomp. And definitely a face stomp. Ting surprises Big Bear with the above kick into his ugly mug, dropping him to the ground for several seconds– long enough for Ting to call out a taunt via recitation of the form he’d just done: “Foot strokes face!” Hell yes it does. Dazed but determined, Bear comes at Ting again, but gets beaten back with a series of brutal kicks, knees and elbows– some while propelling himself through the air with alarming speed. The Aussie’s bluster quickly turns to panic, most hilariously when he briefly backs out of the “ring” (a square of jeering onlookers) not to dodge Ting’s blows but merely as he scrambles away from his threatening offensive stances. Big Bear gets only the briefest of advantages when he distracts Ting by tossing a random audience member at him. Inexplicably, the bystander decides to help Bear out, namely by restraining Ting from behind while Bear lands a few blows on him. Before Bear can follow up with a devastating charge, Ting smartly cancels out his momentum with a knee to the chest, then elbows him in the head. As Bear stumbles back, Ting launches himself into the air, knees tucked in and lands on Bear’s shoulders, finishing him off with double elbows to the big guy’s skull. Bam! A nice opening bid in terms of somewhat extended combat. Ting is shown to be great but not completely invincible, able to cleverly extricate himself from bad situations. Like most of the great movie heroes, he doesn’t want trouble, but when he has to dish out the pain he does so with the right mix of humility, professionalism and enjoyment– you can tell that even this aspiring monk relishes the opportunity to take a thug down a peg. Jaa is of course the centerpiece of it all, moving with a perfect combination of speed, power and surprising flexibility. Ting stops to pray, thinking he’s done. But as he gets up to leave, he’s stopped by a sudden kick…. Ting Fights: Toshiro, according what I can find on IMDB/Wikipedia. But I could have sworn that the announcer refers to him as “The Cheetah,” which would work well with his fighting style, and also fits the animal theme of the other two club fighters. An incredible fast & agile fighter who relies almost entirely on amazing legwork. His name is Japanese so he’s presumably using some sort of karate. Played by Nudhapol Asavabhakhin, who is not Japanese. Even if he does have hair like Naruto. 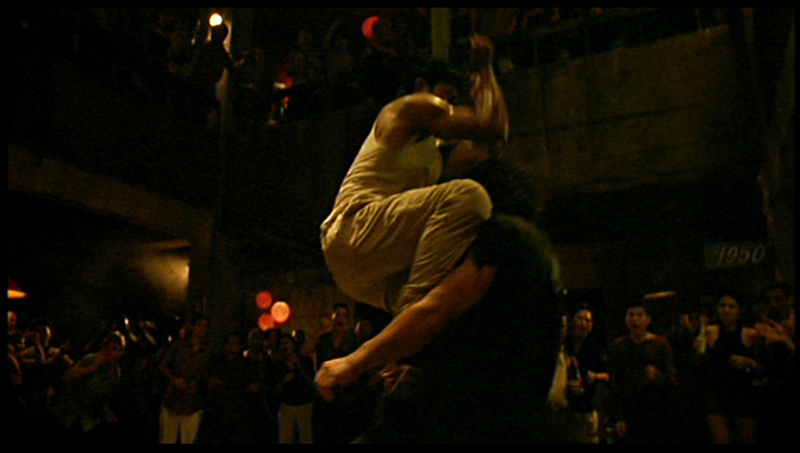 The Fight: It’s one that Ting tries to avoid, but the crowd’s thirsty for more blood and won’t let him leave (more importantly, two rival mob bosses, including our main villain, our upstairs taking bets on the proceedings). One crowd member even brandishes a gun to “encourage” Ting to get back in the fight. Toshiro is much more of a showboat than Big Bear, even vogueing a bit with some high jumps and landing in a wide split. Throughout the fight he keeps swishing his legs back & forth in an effort to confuse and unnerve Ting. It’s not super effective, however. The Cheetah is fast, but Ting is, for the most part, faster. The rural champion avoids the larger part of Toshiro’s lightning kicks and knocks him around with some strong counter kicks. Other times he just calmly blocks Toshiro’s strikes with his own feet & shins. The two have a rhythm together that’s both impressive and comical. Ting runs into some trouble when he tries to go on the direct offensive, as Toshiro seems to be able to dodge faster than Ting can strike. 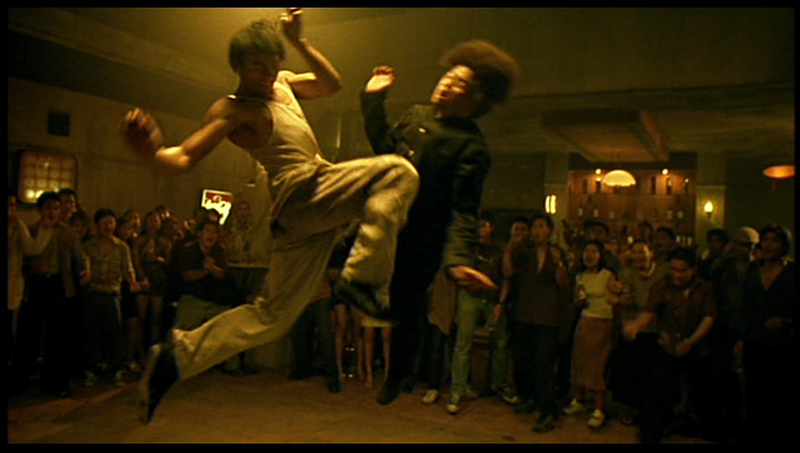 He ducks and side-steps an amazing amount of punches, until Ting realizes the best way to hit him is to draw him in. He lets Toshiro lunge in to attack and then clocks him with a twisty reverse-kick. Ting presses his advantage from there and batters his opponent pretty badly, even canceling out Toshiro’s speed advantage (as he tries to regain control of the battle space) with some smart footwork and a well-placed jump. Eventually Toshiro goes down hard, and seems to concede to Ting. But as soon as the hero turns his back, Toshiro rushes at him, only to be met with a mid-air knee to the chest that puts him down for good. 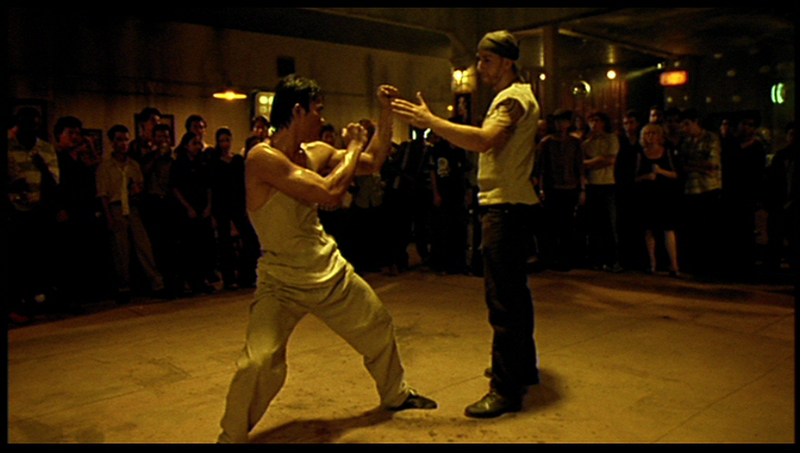 This is a pretty sweet fight, showcasing us a very different challenge to Ting’s skills than Big Bear was. The Aussie was just a big tough thug who relied on strength, Tocheetah has some serious skills and has to be outsmarted. Ting is still unquestionably superior, of course, but he has to really sweat to make it happen. The next fight, however…. Ting Fights: The very aptly-named “Mad Dog,” a non-martial artist who relies not so much on his muscles (which are not insubstantial) but his wild, relentless and creative ferocity. 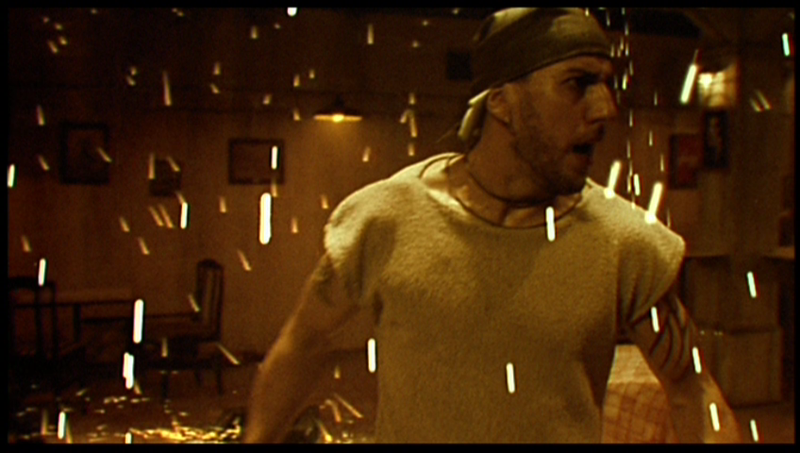 When he finally drops his newspaper and saunters into the ring (he’d been shown casually reading while Ting fought Toshiro), the announcer doesn’t enthusiastically introduce him but appears genuinely panicked, and screams, “Oh God– not Mad Dog!” Played by David Ismalone, a veteran stunt man. Wouldn’t you want your daughter to bring this fella home? The Fight: Mad Dog comes off like quite a good boy at first, walking in with a calm smile against the tense & wary Ting. The canine-esque man even offers a gentlemanly hand to his opponent. Of course it’s a trap, if a fiendishly simple one. As soon as Ting reluctantly accepts the shake, Mad Dog’s other, hidden, beer bottle-wielding hand comes down on Ting’s head. Bad dog! And from there, it’s on like Donkey Kong, Donkey Kong Junior, Candy Kong, and even that annoying one with the surfboard. There is literally nothing Mad Dog won’t do or use against Ting in his effort to win. Ting keeps raining blows against the unpredictable freestylist but most of the time it’s all he can do just to keep up with the canine man. As the battle between the two continues and moves all around the fricking building, the implements Mad Dog seizes and wields against Ting (either by throwing them, swinging them, or charging with them) include more beer bottles, wooden chairs, wooden card tables, a wooden bench, vases, a framed picture, several glass plates, an electric game board, and a live electrical wire attached to the wall.The last of those he rips out and uses to keep Ting at bay. Eventually he pulls it so far out that the building’s power short-circuits a little bit, causing the light to flicker and a shower of sparks to rain down. Throughout the barrage Ting is working overtime just to survive: dodging, blocking, minimizing, and occasionally even absorbing Mad Dog’s assaults. Ting’s defense is quite an impressive sight all its own, as he blunts the impact of swung chairs with his knee, or whips back like a snake to evade thrown projectiles. The fight continues on, but even the ferocious dog starts to get scared of Ting’s skill & resilience. He grabs a female hostage and drags her upstairs, Ting in hot pursuit. When they reach the top floor, Mad Dog lifts a freaking refrigerator and uses it as a weapon. Ting is only momentarily put off by the unconventional weapon, and kicks it until both fridge and Dog get smashed through a wooden wall. Soon enough, in fact, the pair go tumbling into the room where the two mobsters and all their flunkies are hanging out. After a pause in which Ting locks eyes with both the villain and his right-hand man, the bad mobster (worse mobster?) tells Mad Dog “you disappoint me” and hands him a knife to finish the job. Now granted, it’s a pretty sick-looking knife, but considering Mad Dog’s ability to convert every last bit of the building into his arsenal, it’s a tad anticlimactic. Anyway, the knife does little to faze our hero. He soon disarms the weary fighter, then hits him with a series of devastating knee strikes. He finishes off by throwing his foe through the glass window that overlooks the arena, and for good measure he follows along with him and knees him again during the fall, putting the dog down for good. This fight is amazing, and a great end to the natural progression of the three back-to-back battles: slight challenge, moderate challenge, insane challenge (compare to most Bruce Lee movies, which start out at no challenge and gradually escalate to the slight level at the very end). As wild as this fight is, there’s a strange element of realism to it. Real fights aren’t matches of pure skill– anyone can theoretically win, if they’re determined and psychotic enough. There’s no question that for all his skills, Ting is in genuine danger, and one slight mistake in defending against Mad Dog’s onslaught could have gotten him killed; as it is, he gets hurt plenty enough. But more importantly, it’s ridiculously fun. All perfectly choreographed and executed down to the last millimeter and microsecond, it’s a scene notable not just for its invention but its pure audacity. Making a great fight is one thing, but how often do you see something like this? 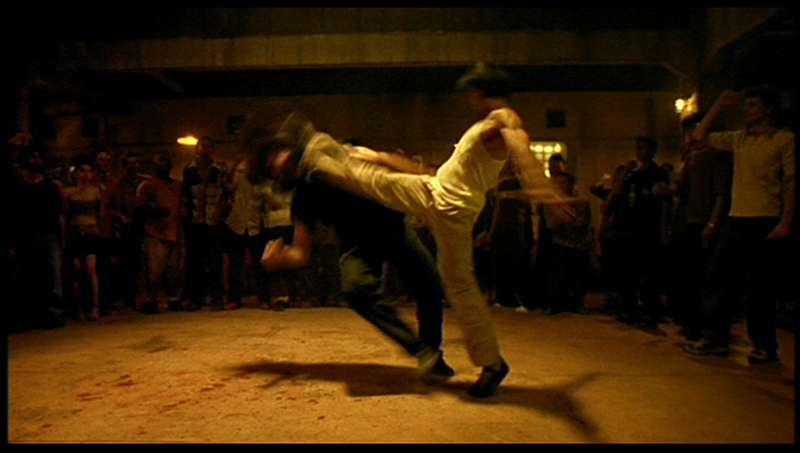 This entry was posted in Ong Bak and tagged chase, martial arts, melee, Muay Thai, one-on-one, Ong Bak.